It’s always better to be safe than sorry when hiring a company to do any type of repair work on your home. Garage door repairs are no different. 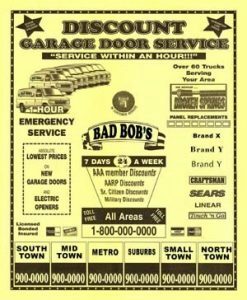 There are thousands of unethical garage door companies (sometimes referred to as “Bad Bobs”) that are preying on customers across the country. They rely on their deceptive company names and advertising to trick the customer into believing they have hired a reputable, neighborhood garage door company. The following is an article that was published by Door & Access Systems Magazine in their Spring 2003 issue [pages 44-45]. The article sheds some light on several different tactics that the Bad Bob companies use, as well as some useful information for homeowners on what to look out for when selecting a garage door company. Locate in a Large Metropolitan Area. Buy Giant Yellow Page Ads. Negotiate Lower Prices for Yellow Page Ads.